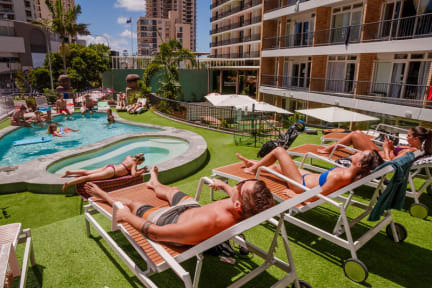 Welcome to Surfers Paradise’s newest hostel, 100m to the beach. 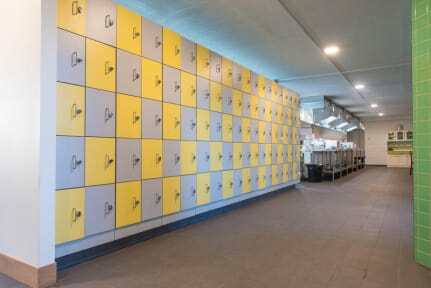 Our stylish and funky dorms have combination safes & USB in each locker plus Air conditioning and en-suites . Free 2GB WiFi, Free Breakfast, Hot tub and sundeck, modern and clean, right next to the transit centre. Absolutely brilliant hostel. No complains. Staff were very helpful and friendly, facilities were exceptional and perfect location. Definitely the best hostel I have stayed in so far. Amazing hostel, super clean, rooms are sizeable and I like the way they’ve designed the bunks. Hot tub and pool great! 5 stars for the amazing WiFi ensuring I watched Game of Thrones uninterrupted! The space in the rooms was great - me and my friend both had lower bunks next to the balcony which gave us a lovely view! The kitchen/communal area was fantastic with great space and facilities to relax and cook! Location was also great; right amidst the shops and easy access to the beach and the tram stations! Loved our stay would definitely come back! I have been travelling for seven months, and try to stay in the better rated hostels. Still this hostel exceeded my expectations. The bunks are sturdy and private, rooms are nice and clean. They have a pool, and very effective staff. Would love to stay again! The nicest cleanest hostel I’ve stayed in so far! Best hostel I have stayed in in Aus! The beds feel really private, you have a light and plug per bed and a very clean en suite bathroom. Huge kitchen which is also clean. One of the cleanest and nicest hostels I have stayed at. A good value for your money. Except you can hear a bit of the bars music in your room and my last night, some girl came to check in our room at 1 in the morning. Turned the lights on and woke the whole room up with her friends. Very clean no doubt at all on that! The staff is not kind and friendly :( The location is awesome and the facilities, what I didn’t like was the free breakfast finishes so early :( but that’s ok.
Staff was friendly and the location is great, but there where trash in bathroom of the room, and never was removed in the 5 days I stayed. Also any person outside the hostel can get in without any control, and the door of my room was broken so you could get in without any key.